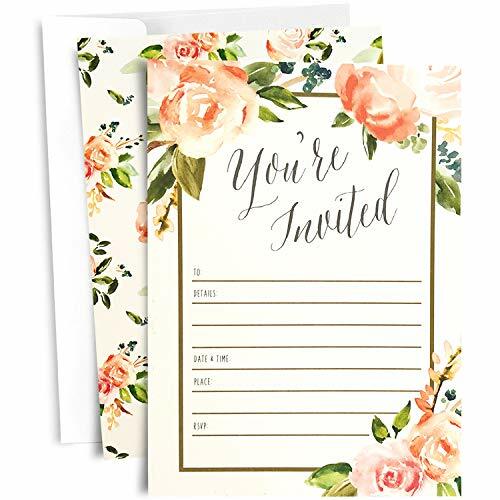 FLORAL PARTY INVITATIONS - This Set of 25, 5x7 Party Invitations with White Envelopes Includes Ample Blank Space to Fill-In Your Custom Text. Features Custom, Watercolor Floral Design on Both Sides Originally Painted by Angie Makes. PERFECT FOR ANY OCCASION - These Versatile Invitations Have a Simple "You're Invited" Text and Can Fit Many Celebrations like Bridal Showers, Girl Baby Showers, Weddings, Rehearsal Dinners, Quinceaneras, Sweet 16 Birthdays, Housewarming, Christenings, Baptisms, Engagements, Anniversaries, and More! EXCELLENT VALUE - Both Cards and White Envelopes are Included! Only .59 Cents Per Card with Envelope. COMMITTED TO QUALITY - Designed with the Details in Mind, These Invitations Come Printed on Both Sides with Vibrant Colors on High-Quality, 140 lb Cardstock with White Envelopes. YOUR SATISFACTION - We Work Hard to Ensure our Product is Outstanding in Both Form and Function. If You are Dissatisfied in Any Way with Your Purchase, we Offer a 100% Refund. If you have any questions about this product by Angie Makes, contact us by completing and submitting the form below. If you are looking for a specif part number, please include it with your message.